The state of European economics today resembles a nice, thick, white snow cover – gross domestic product growth is good, unemployment is dropping, investments are beginning to grow. 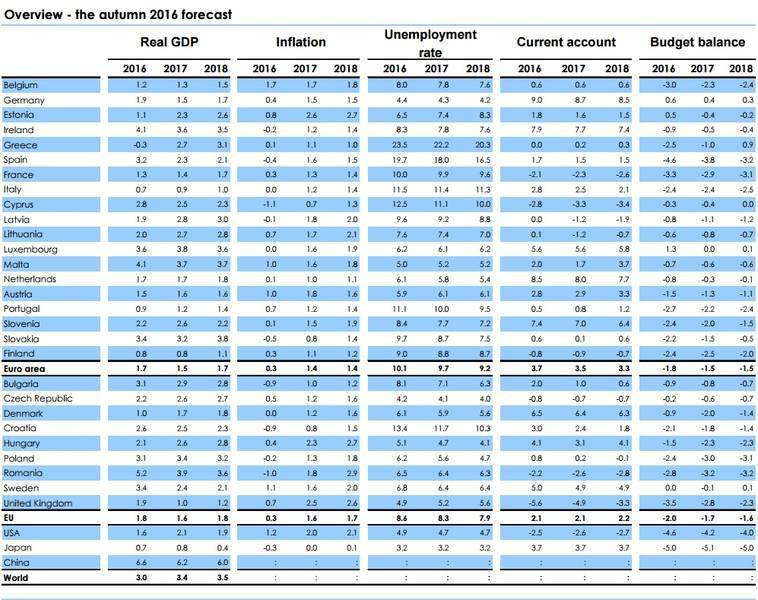 EU economy has grown by 1.9% in 2016 and that of the euro area – by 1.7%, shows the Eurostat data of January of this year. Eight million new jobs have been created since 2013. Unemployment in the EU in September has reached its lowest levels since 2009 – 8.5% and employment in the 20-64 years age group is for the first time higher than in 2008 – 71% in the second quarter of 2016. There is also considerable improvement in fiscal terms. The average level of budget deficit dropped below 2%, while just several years back it was over 6% in the euro area. Government debt has stabilised and is expected to shrink. However, much like it is with snow when it melts away, a troubling sight is uncovered. 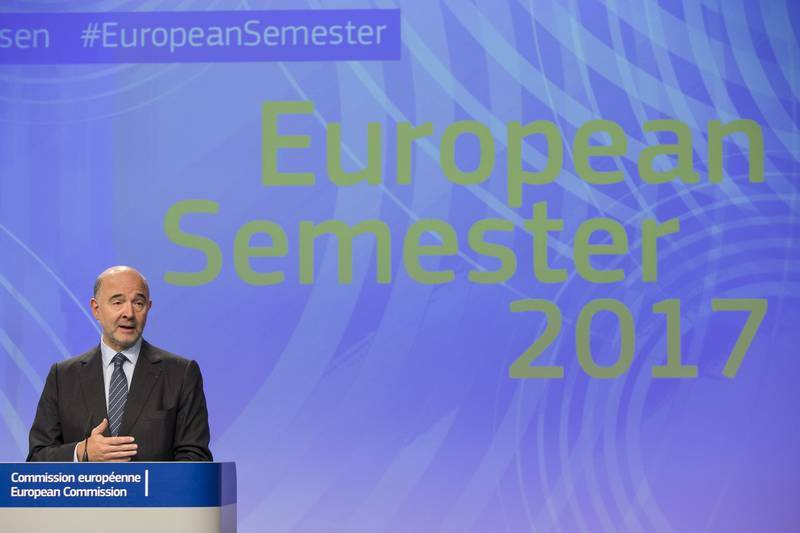 The European semester for 2017, which started in November 2016 shows that European economy continues to be plagued by the same problems as before – the legacy of the crisis continues to impede growth, employment, and investments: structural deficiencies left from the pre-crisis times are still not eradicated and imbalances continue to be sizable. Economic convergence has practically stalled in many member states. The Union faces serious challenges like globalisation, demographic and technological changes. Besides, despite the European semester boosting considerable reforms in member states, the implementation of outlined measures remains disappointing in several spheres and in several states, goes the European Commission’s assessment. What is curious in the new European semester is that the European Commission is attempting to copy the approach of member states, who often use Brussels as an excuse when an unpopular measure needs to be implemented, while praising themselves for successes. So in its report for 2017 the EC claims the praise for opening as many as five million jobs. 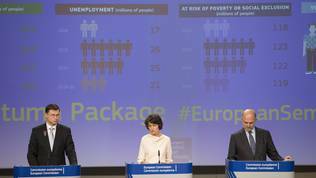 “Eight million new jobs have been created since 2013, out of which almost 5 million have come since the beginning of the mandate of this Commission”, is written in the press release for the presentation of the new European semester. And it is expressly pointed out in the Annual Growth Survey (AGS17) that despite the EU providing an appropriate enabling environment for better regulation and policy orientation, the results are in the hands of member states. For God’s sake, brothers, do not give up on globalisation! 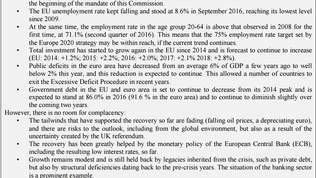 Throughout the 2017 Annual Growth Survey of the EC one can feel the presence of the newly elected US President Donald Trump, the Brexit, and the fear that power in key member states could end up in the hands of anti-European and nationalist leaders. This is why, one of the appeals in the report is not to stop globalisation, but find a solution for those who have not managed to benefit from it. In its AGS for 2017 the European Commission points out that globalisation, and more specifically the rapid growth in the international trading of goods and services, has been the main driver of economic growth in the last few decades. “The recently observed increase in protectionism and, more generally, growing scepticism about further internationalisation of economic activity, often coined as the ‘new backlash against globalisation’ could put this growth driver at risk”, is said in the report. Such treatment of globalisation could thwart the already slow growth of international trade and enhance uncertainty, which in turn will smother domestic consumption, believes the Commission. At the same time, the survey discloses some very interesting data, which make it clear that exports outside the EU have turned into an ever more important source of employment for Europeans. Thanks to the international competitiveness of European companies over 30 million jobs rely on exports outside of the EU. This is a two-thirds increase compared to 15 years ago. This means, the survey points out, that approximately one in seven jobs relies on exports. The following example is cited – 200 000 jobs in Poland, 140 000 in Italy, and 130 000 in the leaving Great Britain are linked to German exports outside the EU. French exports support 150 000 jobs in Germany, 50 000 in Spain, and 30 000 in Belgium. This is why, the survey warns, much care needs to be taken to preserve openness and facilitate the further integration of European companies into the global chains, especially companies selling services. 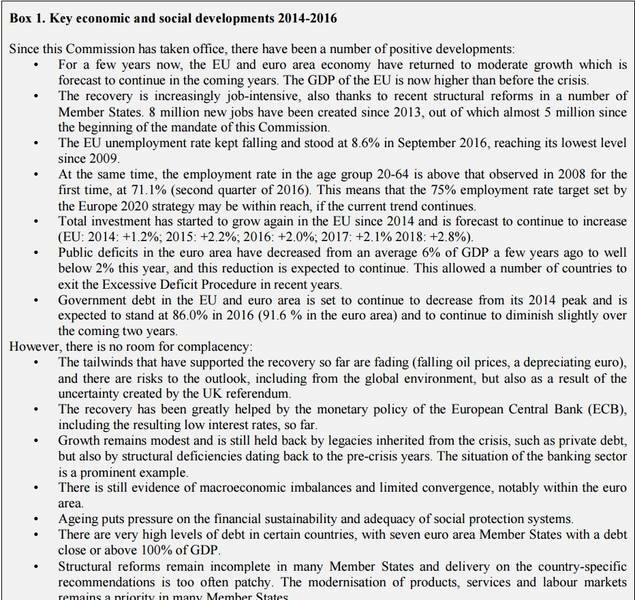 The EC proposes that in 2017 member states double their efforts in three areas: boosting investment, pursuing structural reforms, and providing responsible fiscal policies. These might sound cliché at first glance, but hidden behind this Brussels jargon are the worst problems of the EU and its not-so-common market. One of the largest problems faced by the growth of the European economy is access to finance. In some member states this problem has been identified by small and medium-sized enterprises (SMEs) as the most important challenge. For example in Greece 30% of SMEs point out access to financing as their most serious problem, same for 25% in Cyprus. The financing problem is also pointed out by the smallest of companies – 12%, by relatively new enterprises – 13%, and by young, but growing companies (having growth of 20% or more) – 14%. 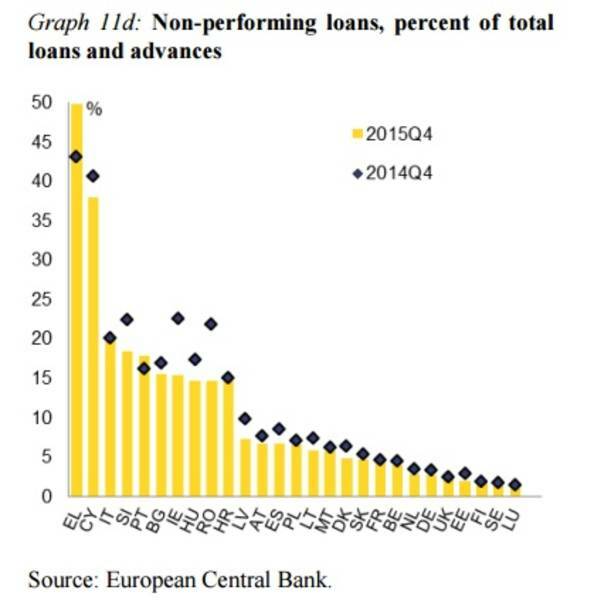 The main source of financing to all those business entities is the banking sector, which has the biggest legacy from the crisis in the EU, for the high level of non-performing loans is a serious problem in many of the member states. Another obstacle to investment is the considerable tax burden and over-complicated taxation systems, corruption, the insufficient research and development activity. All this is outlined in the country specific recommendations, which will be presented in March. 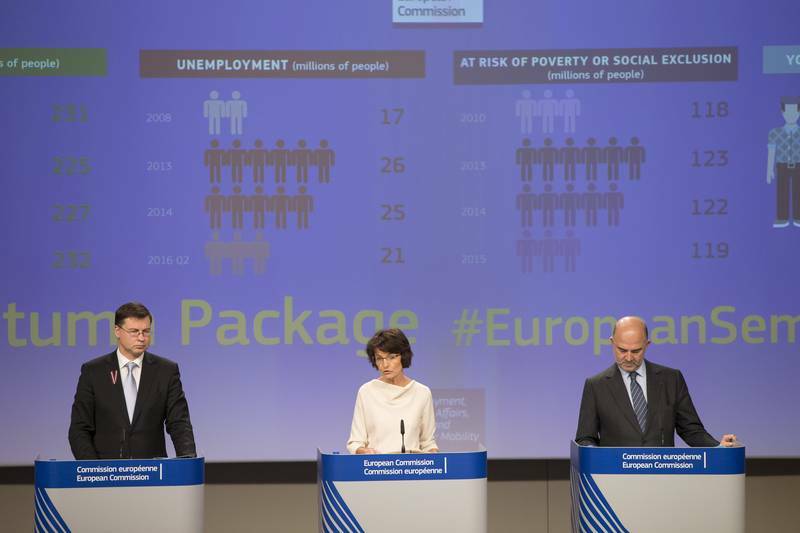 The second element - pursuing structural reforms – opens up even more challenges. In many member states the working-age population and labour force in general are beginning to shrink. This is mostly due to low birth-rates, emigration, and health care. The labour market is segmented and this is going to have negative impact on domestic demand and productivity growth, warns the EC. Education is a key factor, believes the Commission. In 2015, the rate of children dropping out of school early has declined in almost all member states, the average being 11%. Despite that, this percentage remains high among the Roma population and children of migratory descent. In 17 member states the percentage of people having higher education is above the 40% set in the Europe 2020 strategy, but under international standards too many Europeans have a low level of basic and digital skills. 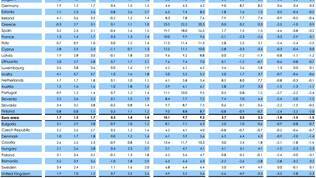 This places Europe at a disadvantage in a fast-developing global economy, concludes the EC. Another problem is the unfinished integration of the domestic market for services and the still existent barriers to accessing certain segments of these markets, which limits the spread of internal EU trading in the services markets as well. “Credit” for this is due to the problems with recognising diplomas and regulated professions. Completion of the common market was also one of the appeals of ECB boss Mario Draghi. In his first appearance in front of the EP’s economic committee this year he stated that the number one priority for all member states should be the completion of the single market. Back in second place are the various specific structural reforms like labour market reform, reform of the judiciary, education, etc. The third priority sphere in AGS17 is responsible fiscal policy. 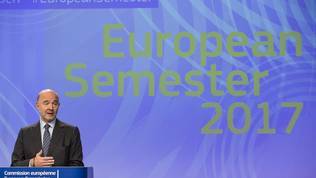 Together with the presentation of Semester 2017 the EC attempted to loosen belt buckles, but so far the idea is met with hostility. The Commission’s idea was to negotiate a positive fiscal stance for the euro area. Some states welcomed the idea, but it was generally dismissed. Mario Draghi too was critical about it, stating that at this stage it cannot be implemented. In his words, there currently is no common mechanism for implementing a common fiscal policy, so the idea is rather harmful. The Commission’s argumentation is that the population is growing older, parallel to technological development, which will lead to higher public expenses for healthcare. Ever since the beginning of economic recovery (the year 2015), the EC and the ECB have been warning repeatedly that its main driver were the so called “tail winds” like low oil prices and depreciation of the euro, which is the result of the ECB’s monetary policy. One of the important documents, accompanying the start of every economic semester is the Alert Mechanism Report. It concludes that these tail winds are already weakening, while at the same time risks not only remain, but are growing. Uncertainty stems from the process of re-balancing of the Chinese economy, the behaviour of the USA, geopolitical risks, linked to growing populism and increasing protectionism. Looked at from this perspective the situation in member states is diverse. Progress is made regarding the correction of external deficits, but there are still serious current account surpluses. The greatest progress is marked regarding external imbalances in net-debtor countries, while in all net-creditors the current account surpluses are not being corrected, in some cases are even growing. Debt clearance continues, but it is slow and uneven. Debt continues to hang like the sword of doom above the economic perspectives of many member states. The conclusion of the EC in the Alert Mechanism Report is that the same sources of risk, which have been outlined in the previous semester, are being reconfirmed. Besides external imbalances, those are also the banking sector, burdened by non-performing loans, the signs of overheating in the real estate market or the labour market in some states. The EC is going to be more specific in the country specific reports, which are going to be presented in March on Bulgaria, Croatia, Cyprus, Finland, France, Germany, Ireland, Italy, The Netherlands, Portugal, Slovenia, Spain, and Sweden. Those are the countries where macroeconomic imbalances have been identified, possessing the potential to create trouble. Anyway, the number of countries is smaller than in the previous semester, when macroeconomic imbalances were established in 19 states. Germany continues to be among the countries with high current account surpluses, together with Denmark and The Netherlands. All of them are above the acceptable threshold. German deficit has expanded to 8.5% of GDP in 2015. The Dutch one is also high, but it is in the process of a two-year decline. Among creditor-states, Denmark, Germany, Malta, and The Netherlands have surpluses exceeding 5% of GDP. In 2015 the surpluses of Germany and The Netherlands amounted to 257 billion euro and 57 billion euro respectively of the aggregated euro area surplus. Among debtors, it is only Great Britain which exceeds the limit, the others are managing to re-balance. Excessive indebtedness in the private sector is a problem in many member states. It exceeded acceptable levels in 13 of them in 2015. All of them were in the same position in 2009, with the exception of France, which joined this group in 2011. Cyprus, Ireland, and Luxembourg have the highest levels of private sector debt. The EC has noted, however, that specific factors, like multinational companies, contribute to that fact. Reasons for excessive debt are diverse. In Belgium, Cyprus, Finland, Ireland, Luxembourg, The Netherlands, Portugal, and Sweden both households and non-financial corporations have debts exceeding the EU average, due to factors like growth of easy credits before the crisis, aimed at purchasing real estate. Risks are more serious in countries like Croatia, Hungary, Poland, and Romania, where large portions of domestic debt are in foreign currencies. In general the capitalisation of EU banks is improving, but there are still problems. Capital ratio in the euro area was 14.2% (Tier 1 capital to risk-weighted assets) in 2015, which marks an increase compared to 2011 when the capital ratio was 10.4%. There is over-capitalisation in ten member states – Bulgaria, Luxembourg, Romania, Slovenia, and Sweden – 17% - and below 13% in six states: Italy, Portugal, and Spain. Real estate prices have grown in 22 member states with excessive values in Denmark, Estonia, Ireland, Luxembourg, Hungary, and Sweden. 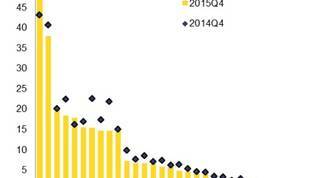 In Croatia, Italy, and Latvia real estate prices dropped further from the levels which were considered undervalued. A sizable drop in the public debt-to-GDP ratio is noticeable in Denmark, Germany, Latvia, Malta, and The Netherlands. A lot of states, however, continue to have an excessively high ratio – Belgium, Croatia, Cyprus, France, Greece, Italy, Portugal, Spain. Ireland is the sole country, which has undertaken a serious and persistent reduction of government debt, aided by a strong economic growth. The unemployment situation also varies between member states. It remains highest in Greece and Spain, where it is around 20%. In Croatia, Cyprus, Italy, and Portugal it exceeds 10%. According to the EC labour mobility has aided significantly in softening the situation in the labour market. In 2015 the net inflows of labour force were the strongest in Austria, Germany, and Luxembourg, while the largest outflow of workforce happened in Croatia, Greece, Latvia, and Lithuania. The social situation is slowly improving, but remains difficult in many member states. The percentage of people living in risk of poverty or social exclusion has dropped from 24.4% in 2014 to 23.6% in 2015. This happened in three quarters of member states. The greatest decrease in the last three years was seen in Bulgaria, Hungary, Latvia, and Romania, while Cyprus, Greece, The Netherlands, Portugal, and Spain mark the largest increase. Levels vary – from 40% in Bulgaria and Romania, to less than 20% in The Czech Republic, France, The Netherlands, Nordic countries. In pre-crisis years risks dropped in several Central and Eastern members with the greatest decrease being noted in Poland and Romania. - Great Britain: Growth to moderate and inflation to rise. Member states in general agree with the Commission’s conclusions. At the January meeting of ministers of finance the EC’s report on the AGS and the Alert Mechanism have been approved. It is pointed out, however, that there is not enough attention dedicated on the need of a product markets reform, while it should be a priority for it will directly boost productivity and production, regardless of the economic conditions. Ministers once again agree that it is necessary to monitor the implementation of recommendations throughout the whole year.